After visiting Gunkanjima in Nagasaki City in the morning I was heading towards Hirado in the afternoon. Before arriving there, I stopped by in Omura City which is on the way. 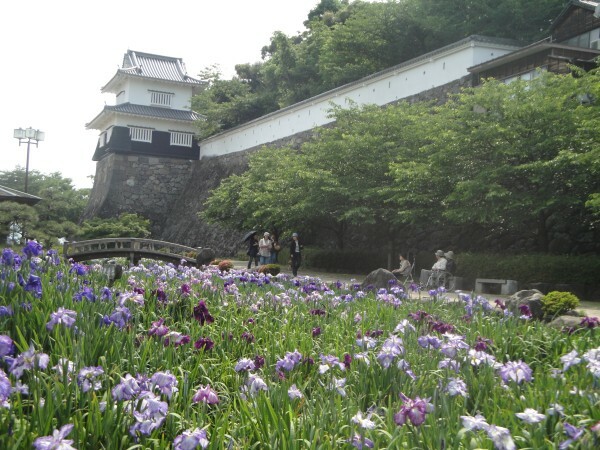 I wanted to visit Kushima Castle in Omura Park so that I could add it to my Japanese Castles list. From JR Nagasaki Station to JR Omura Station it takes less than an hour. From there it’s a 20 mins walk to Omura Park. I turned into a huge fan of manhole covers here in Japan. There are so many beautiful ones and each city has their own design. After some walking I finally reached Omura Park (大村公園). As you can see spring would be a great time to visit. Unfortunately it was winter and thus no flowers at all. Only some naked trees were greeting me. The castle is located within the park. It doesn’t have a main tower anymore, so there’s nothing you can enter. Actually it’s better known as “Kushima Castle“. It was built in 1599 by Omura Yoshiaki. This board had some nice information about the original castle. That’s pretty much all you can see of the castle remains. That and a few walls. Besides the castle and its ruins Omura Park also has a shrine on its grounds. After washing your hands and mouth you can go and pray! I usually don’t! The only time I do is in January during “Hatsumode“. Somebody put their lucky charm on a trunk! The Ema of Omura Shrine. Quite nice, but not interesting enough to buy one. The omikuji of the shrine were really colorful and nicely decorated! There was another very small shrine right next to the bigger Omura Shrine! And I also spotted a cat on the shrine grounds. It wasn’t a stray cat. It belonged to the people at Omura Shrine! It was such a beauty! I was fascinated by its completely white fur and blue eyes! Back at JR Omura Station. Although it was already January they still had the Christmas illumination up everywhere. In Japan you’ll see it throughout winter everywhere – even long after Christmas! It was already getting dark and I took a train to Hirado which was my next destination of my winter vacation 2011/12. Great post and love all the information and pictures. I can’t say that I know much about Kushima Castle, but it looks interesting and I will add it to my castles to visit in Japan. I love the photos of the fortunes :shiawase: ! Great stuff! You missed the irises but your photos of the place are stunning. And, good on you for dropping by here. Many wouldn’t. I’m really looking forward to your upcoming posts…. I got my share of irises elsewhere this year, so it’s ok.
Winter is often not the best season to go traveling as the landscapes are boring unless you go where there’s a lot of snow. A snow covered castle can be very beautiful, too! Wow, your photo looks so beautiful! D: Sorry in advance for asking about this topic, but I am kind of freaking out :whyohwhy: about it and I hope you can help me out!! I have heard that there are squat toilets in the restrooms of train stations in Japan. But only yesterday, I read up about it more and found an article about it. it seems to be everywhere in Japan?!! I mean, they said there are plenty of the American-style toilets too, but… oh, the article is called “Japanese-style squat toilets: A surprising way to stay healthy”. Haha, you worry too much. But in general, you can find Western-style toilets almost everywhere nowadays, especially in department stores, conbinis, restaurants etc. also, do you have any advice on where the best/cleanest restrooms are? like…in department stores or malls or Starbucks, etc.?? In general toilets are very clean no matter where you go – unless in smaller parks maybe. Most department stores, conbinis, even Starbucks have Western-style toilets, although if you’ve been around a lot, you’ve seen EVERYTHING. Finding clean Western-style toilets isn’t difficult, especially if you are in the bigger cities or visiting the popular tourist spots. It really should be ok.